I had an amazing time yesterday presenting my experience with Salesforce Einstein artificial intelligence features, like Lead Scoring, Opportunity Insights, automated Activity Capture and Einstein Analytics dashboard. alongside executives from CBS, Neilsen, Accenture, IBM, LogMeIn and some other pretty prestigious executives (eep!). 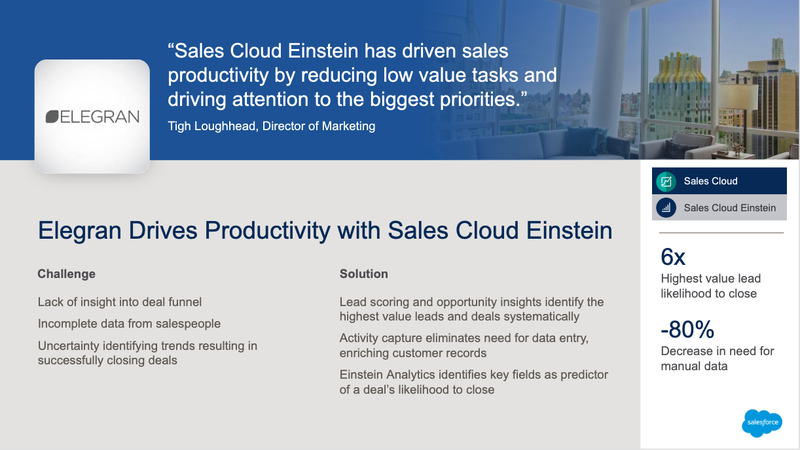 Einstein actually analyzes your entire database, revising it's algorithm monthly, looking for trends and ranking certain attributes as meaningful predicting a lead or a deal's likelihood to close. 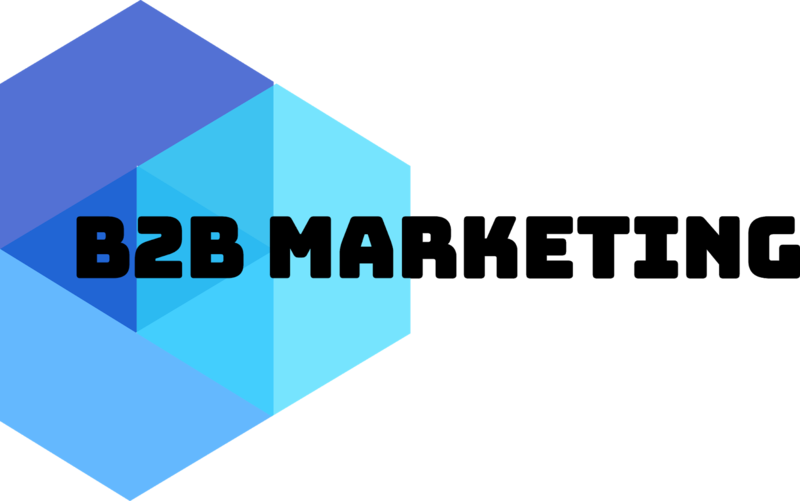 There is a lot of bluster around AI, but practically speaking, it could put data analysts and marketers out of a job before long... but it's amazing stuff to talk about and learn about in the meantime! Well, I think I read somewhere something that really stuck with me, where Einstein talked about the definition of “genius” being “the ability to take the complex and make it simple,” and we fundamentally wanted to be smarter about our business. I think it really boiled down to three different factors, a: we wanted to get more insight into our pipeline, b: retrieve more data from our salespeople, and c: the ability to recognize trends that resulted in successful deals. For the insight piece, I was hired a little over four years ago to run our marketing strategy with a focus on lead generation. And, while I had no trouble spending the company’s money, I quickly identified a lack of information towards the middle of the sales funnel, and a lot of leads and deals were slipping through the cracks. We were also hoping that AI could assist in data capture and hopefully enrich it. One of my biggest challenges is getting my agents to log multiple points of contact with prospective customers, and I know this issue is fairy ubiquitous amongst salespeople. Finally, we wanted to turn to big data to build business intelligence around closing deals, and look for unknown insights we may not be able to see on a macro level. I have a couple of data analysts working for me, and all they do is visualize and model data to understand ROI and sales performance. But I sometimes doubt that we always see the big picture, and a specific example of this is that we specialize in new construction, where the sales cycle can be 3 - 4 years long, so trying to attribute a specific keyword or sales technique to a multimillion dollar deal can be like trying to find a needle in a haystack. We’re just getting started with some of the more powerful features of Einstein, but we have thousands of leads in our database, and we have found that there comes a point where too much opportunity becomes counterproductive. We don’t think that it’s too many leads, but rather that my agents don’t know how to prioritize the best leads first, so we turned lead and opportunity insights to identify our highest value leads, and most important deals. We’ve been using Salesforce Inbox since about 2016, which was the first Salesforce product launched with Artificial Intelligence baked in. And we are huge fans of Einstein Activity Capture, which systematically logs all email correspondence and calendar events from my users and clients, collecting a ton of data and reducing a lot of the drag on my teams need to do manual data entry, as well as the ability for my sales managers the tools to help coach users. Finally, as we looked further into Einstein, AI wasn’t some mysterious deep learning algorithm happening in behind the scenes— there are actually specific ranking factors in the Lead Score— both positive and negative, clearly displayed in Analytics Studio for admins, and on the page records for users, which they can utilize or decide to disregard if irrelevant. I’m really excited to start to build processes around Einstein. At Elegran, we’re really focusing this quarter on building out a coaching program, and one of the things I’ve already done is segment our leads by Lead Source, and then break them out into buckets of lead score, and distribute them to Sales Managers. We’re already seeing that leads with a score between 80-99 are 6x more likely to be converted, and these are the leads I want my team focused on? So one of the other products I didn’t get to talk about much yet are the out of the box dashboards in Analytics Studio that come with Einstein. One of the dashboards actually shows the predictive correlation of field completion to deal conversion. I don’t know if anyone has ever used an app called field trip, but Analytics studio will actually show you not only whether or not that field is filled out, but whether it's relevant to closing a deal. plans for the future of AI? The real beauty of AI is that the Einstein algorithm is updated every month I think, and I’ve already seen the model improve. I’ve been using AI elsewhere, like in our Search Engine Marketing campaigns where I rely on AI automated bidding strategies… and what I’ve seen is that the more data you have, the better the intelligence functions. So with all the talk about connectivity these days, I think there is going to be a big push to get all our data on a single platform. I’m sure you’ve heard this before, but there are ton of useful tutorials on Trailhead and videos on the SF Admins website. And, probably the most useful tool is the Einstein Readiness Assessor, similar to the Lightning Readiness Assessor. With just a click of a button you’ll get a great idea of if your org meets the criteria for Einstein to be effective, as well as what features of Einstein your org is capable of using. Start small and be patient. I started off trying to over engineer the process, trying to cherry pick different fields I wanted to analyze that I thought were relevant. It was only when I took a step back and let Einstein analyze all of my data did I really start to see results.